One of the most difficult and time consuming cleaning processes is the tile and grout in your home or place of business. 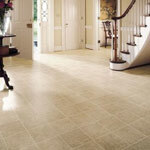 Over time dirt gets worked into small crevasses of your tile and grout and can be nearly impossible to remove. We use our high-end cleaning products, equipment and hot water to get the ground in dirt out your tile and grout, leaving it looking brand new. Different types of tile and grout may require different cleaning techniques, and this is the reason we send one of our fully trained technicians to your home or work. After the cleaning process takes place, we will use a special penetrating sealant to keep your tile and grout cleaner for a longer period of time.